The contentious consolidated Lagos State Environmental Law and nine others are currently being reviewed by lawmakers in the Lagos State House of Assembly. Speaker of the Assembly, Rt. Hon. Mudashiru Obasa, spoke to journalists at Park Inn By Radisson Hotel, Kuto, Abeokuta, Ogun State venue of a 3-Day Retreat. 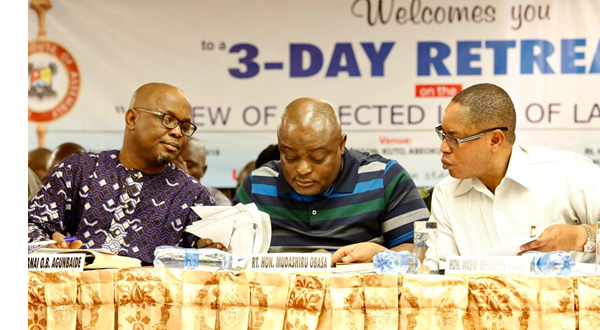 Obasa stated that the essence of coming together to review the laws of the state was to serve the interest of members of the public and create opportunities for them. He added that the review would give the lawmakers an opportunity to do what would be of benefit to the people. Some of the laws being reviewed are Public Private Partnership Law, Urban & Regional Planning Law/Model City Law, Public Procurement Agency Law, Consolidated Laws On the Environment, and Transport Law. Others ate Environmental Law (Waste Management), Neighbourhood Safety Agency, Lagos State House of Assembly Service Commission and Energy Law. “Actually, we have a good environmental law in place but for the fact that we have problems with the implementation of the law does not mean that the law is not good. “We are here because people raised eyebrow over some aspects of the laws and we want to see how we could amend them. “We have brought in people, who have served as commissioners as insiders to tell us what is wrong with the laws and what we need to do. “You would realise that we have always been receiving people on protests. That we are here does mean we have done something wrong. We should continue to review our laws. It is by going through them regularly that we will prepare our state for a better law. “Even if a law was passe yesterday we can come around to review it today,” he said. The Speaker emphasized that there was nothing like Visionscape in the new Environmental Law of the state though he stressed there are sections in the law that gives opportunity to the executive to operate PPP. He said: “It depends on the people they brought in if they are capable. In this case there is an attachment in the law that states that they must make a recourse to the House if they want to engage a private company which is why we say Visionscape is not known to us because we are not aware of it. It will be recalled that the Assembly recently ordered the PSP operators on refuse clearing in the state to go back to work due to the heaps of refuse scattered all over the state. On Land Use Charge, Obasa said that the Committee on Lands has finished it’s assignment on it and that they were awaiting them to make presentations. He however, promised that the people would be given an acceptable feedback on the matter. He also spoke on the controversies surrounding employment in the Lagos Neighborhood Safety Corps (LNSC). He said that some people produced fake employment letters and clearance, and that the boss of the agency had been invited by the house on the issue. Also speaking to journalists during the programme, the Majority Leader of the House, Hon. Sanai Agunbiade said that the House always review the laws of the state. “We review our laws, when there are new challenges and some issues were not put in the right perspectives or we see lacuna ambiguity or we feel hat some things would have to be put right. “That is why we bring in consultants to talk about them. We call them to advise us and make the laws stronger. We are reviewing them sector by sector and we will go back now and inculcate some of these things to make the laws stronger,” he said. The Clerk of the House, Mr. Sanni Azeez had earlier welcomed the lawmakers and other participants to the event and assured them that the programme had been packaged to make the review of the 10 selected laws possible and acceptable to the people.